Cadence Winery is the work of winemaker Ben Smith and his wife Gaye McNutt. Before turning his attention to winemaking full-time at the beginning of this decade, Smith spent fourteen years as a mechanical engineer at Boeing working on airplane designs. While at Boeing, Smith began exploring his interest in winemaking via the Boeing Wine Club. Smith made his first wine in a five gallon carboy, entered it into a competition, and won! The rest, as they say, is history. Cadence made its first vintage in 1998. The name Cadence has multiple meanings for the couple, from their love of music, cycling, and triathlons, to seeking “balance, harmony, and precision” in their wines. Fittingly, Cadence moves very much to its own rhythm. Unlike many New World wines which are big on fruit and charm early in life only to fade quickly within a few years, Cadence’s wines require time to fully reveal their charms, becoming more and more impressive with each passing year in the cellar. This is against the grain of the “drink now” approach of many winemakers – and wine buyers – but those with patience are generously rewarded. Cadence’s wines display much more of an Old World touch than many – perhaps any – winery in Washington. While there is focused fruit, the emphasis is very much on the expression of the terroir and the creation of highly structured wines. The result, while atypical for Washington, is some of the most dynamic, age-worthy wines being produced in the state. Cadence’s wines are also unique in that Cabernet Franc is always featured in the blends - a callout to France’s Cheval Blanc. Cadence currently produces four vineyard-designated red blends from the Red Mountain AVA, one from Ciel du Cheval, one from Taptiel, and two from the winery’s estate vineyard, Cara Mia. Smith has been working with fruit from Ciel du Cheval, one of the finest vineyards in Washington, since 1999. Few show a finer touch with the vineyard’s fruit. In an acknowledgement of his success with this vineyard, Smith was the first winemaker to work with Paul McBride and Ryan Johnson on the Grand Reve project. This project pairs top Washington winemakers with Ciel du Cheval fruit (Grand Reve will be using fruit from it estate vineyard in the coming years). Smith’s Collaboration Series I wines recently received 95 point scores from Wine Advocate for the 2005 and 2006 vintages. In addition to his red blends from Ciel du Cheval and Taptiel, Smith creates two reserve wines from Cara Mia Vineyard, Cadence’s estate vineyard. The 2007 vintage marks the fourth leaf for this vineyard. While the second vintage from Cara Mia improves upon the first, it will take some time before these vines can match the intensity and structure of the older vines of Ciel and Taptiel. But it will be fun watching them get there. Of note, the 2007 vintage marks a label change for the winery. 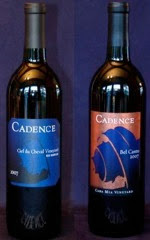 In the 2006 vintage Cadence began using an image of an embossed barrel on their reserve wines from Cara Mia Vineyard. This year the Ciel du Cheval and Taptiel wines will feature a similar, albeit differentiated, label. Cadence produces 2,100 cases annually. Note: Wines double decanted two hours prior to tasting. All wines sampled at 60 degrees. Rating: ** (Exceptional) An attractive nose with lots of earth, floral notes, chocolate, and black fruit. Tight and tannic on the taste with a lot of currant flavors. Give this layered, exceptional wine three to five years. 39% Cabernet Sauvignon, 35% Cabernet Franc, 13% Merlot, 13% Petit Verdot. 14.4% alcohol. 495 cases produced. Rating: * (Excellent) Dark and purply. An extremely fragrant, beautiful nose with earth, currant, and black licorice. A bit more masculine in style than the Ciel wine with a lot of structure. Lingers for a long finish. Give three to five years. 56% Cabernet Sauvignon, 33% Cabernet Franc, 11% Merlot. 14.4% alcohol. 440 cases produced. Rating: +/* (Good/Excellent) Extremely dark purple. Intensely aromatic with pepper and black licorice. Lighter on the palate in terms of the fruit than the other wines sampled. A good scaffolding but needs some time to come into its own. 14.4% alcohol. 496 cases produced. Rating: * (Excellent) Dark to the point of being opaque. A beautiful, expressive nose with chocolate, licorice, earth, dark fruit, spice, and light herbal notes. Elegantly structured on the palate. Less fruit intensity than the Ciel and Taptiel offerings but still delivers with excellent focus and structure. Give two to three years. 62% Cabernet Franc, 31% Merlot, 7% Petit Verdot. 14.4% alcohol. 570 cases produced. Rating: * (Excellent) Nose really pops on this wine with lots and lots of aged fruit and ground black licorice. Gorgeously textured with a number of different layers on the palate. Drinking beautifully with a long life ahead of it. 40% Cabernet Sauvignon, 23% Merlot, 22% Cabernet Franc, 15% Petit Verdot. Cadence is the best under the radar producer in Washington. Point chasers never hear of them and they put out fantastic juice with a lot of finesse. Anon, I agree that as far as unsung heroes go, it's hard to think of a better one than Cadence. Not that the winery has not received a great deal of accolades and high scores over the years; they have. However, the winery hasn't (yet) achieved the status commensurate with the quality of wine they are producing. I expect the Grand Reve project to bring the winery well-deserved additional attention. Just had a 2000 cab sauv last weekend. It aged well. Great balance. Wish I could find more. I am envious! Ten years is about perfect for these wines. Thanks for the comment. Great Post,t hanks for all the extra information on Ben and Cadence. I need to taste more of these wines. Thanks.